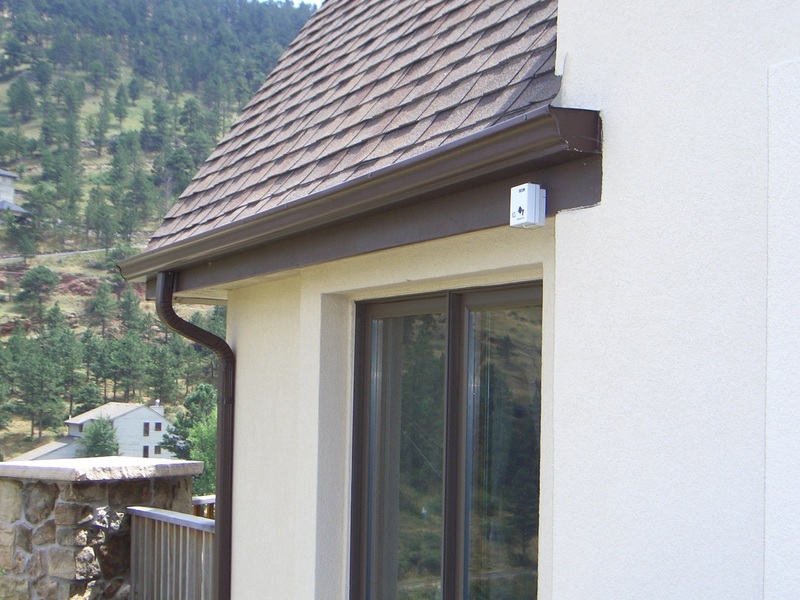 Whether you are looking for the tools to be ready to provide your home or crew with some protection against wildfires or you're looking to supplement your FOAMSAFE System™ and/or FireShades™, CFPI's line of accessories will meet your needs. CFPI's line of professional grade tools, hoses, personal gear, pumps or CFPI's unique and effective FOAMSAFE Bakpak™ can help make the difference. If you have a pool you might consider the CPFI water pump and hoses. These can quickly be laid out in place and used by yourself or give your local fire department team an upper hand as they come onto your property to protect your home at the moment the wildfire approaches. FOAMSAFE Bakpak™ The CFPI industry unique Bakpak™ allows you to apply a covering of non-toxic, plant safe, animal safe CLASS A FOAM on your home, valuable landscape and local trees. You can then leave the area knowing the foam will be there for 8-12 hours ready to provide protection. Afterwards, the foam will simply disappear with no messy or cleanup required. We're happy to help you choose the right pieces that fits both your needs and your budget. Contact us and we can also provide some recommendations based on your specific situation or budget. Contact us for pricing. If your not sure what you need, we have specialists that can help you choose the right equipment, gear and tools to help you prepare for wildfire. When the fire comes it's too late to get prepared! Call us today, we can help. We are creating an on line marketplace for direct ordering of our available products. Until this marketplace is complete, please call us for pricing and availablility. If you don't see a product on our website, call and we will provide you with our price and availability for that product. Estate managers or owners, call us for special pricing and free consultations to help you decides what you need to protect your properties. This kit is designed for you to leave for firefighters when you evacuate, or use to protect your home when evacuation is not possible. The Kit consists of 100' of 1" firehose, 2 nozzles, a 1-11/2" adapter and 5 gallons of foam concentrate. The Kit comes with a bag to store it all in, and set out if a wildfire threatens your community. If you have a pool, pond, or other stored water source add a pump to your order for firefighters to use your stored water. This kit could make the difference and you'll feel great knowing your can do something to help and support your local fire department. Pro grade fire resistant jumpsuit made of Nomex. 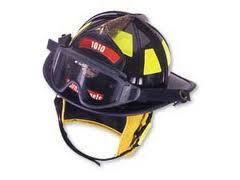 Great for wearing while evacuating or firefighting operations. Protects from embers and heat. Available in 6-9oz Nomex material. Sizes range from Small to 2X. Sets up in minutes, this portable water tank gives you 500-3000 gallons of water ready to pump into your hoses for pretreating or direct firefighting. Add our foam for better penetration. Additional hardline and pump needed for pumping into firehose. Call our specialists to help you choose the right pieces for a complete kit, or buy the water tank alone. Helmet, neck protector, and goggles. Protect your head from falling embers, branches, or flying debris. Our helmets are professional grade, are adjustable and will fit any size head. By as a kit with goggles and neck protector, or by separate. Use this professional fire rake to clear and grub areas when creating your defensible space. This Hazel Hoe is one of a firefighters favorite tools and will dig down 2-3 inches to be sure any combustible material is removed. Know when a wildfire is approaching. Have plenty of warning to evacuate with the Fire Alert System, which detects a wildfire up to 1/2 mile away and notifies you automatically via your cell phone - calls up to 4 phone numbers of your choice. Also activates a FOAMSAFE FireMaster System. No power required. Click HERE for details or call our specialists who can answer any questions. 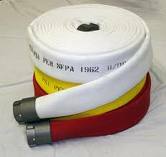 Fire Hose is something that every "high fire risk area" home owner should have on hand. Comes in double or single jacket, with many types of pressure ratings, sizes and fittings. Call our specialists to help you decide which hose is right for you. We take the guess work out of choosing the right tools for protecting your home from wildfire.